Navigate virtually anywhere with the Wireless Multi-Trac Blue LED Optical Mouse. Blue LED technology allows you to point and click on more surfaces than other mice from a glass table to the granite kitchen counter to airport carpeting. 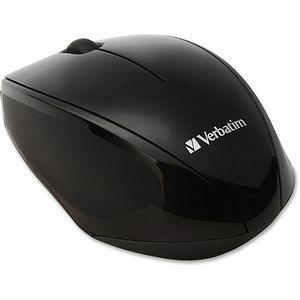 Contour ergo-friendly shape and easy grip surface let you use this mouse comfortably for hours. Efficient low-power consumption requires only one AA battery. Plug in the included nano receiver and forgot about it. The small receiver plugs into your laptop's port and can stay; no need to plug and unplug bulky receiver or deal with cords. Or you can store the small nano receiver in the battery compartment, offering convenient storage and portability, which makes this a great full-size, go-everywhere computer accessory.